As urban areas become more population-dense, cities and developers are finding it increasingly difficult to find quiet locations for new apartment buildings, hotels, office buildings and commercial spaces. As such, the focus has shifted to blocking out the surrounding noise from traffic, rail lines, surrounding businesses, and pedestrians. This is where smart design – and the use of effective acoustic windows – comes in. 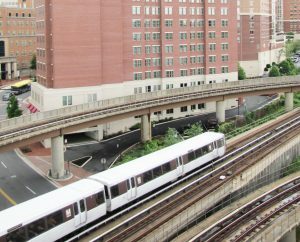 In a recent Arch Daily article, the challenge of designing a quiet apartment building in a noisy area – specifically, one where three major New York City subway lines diverge – was discussed. There were three key tips shared for creating a quiet living space despite a significant amount of outside noise. We’ll summarize those tips below. The first – and perhaps most obvious – step is choosing the quietest space possible for the building footprint. Get as far away from rail lines, freeways and other busy areas as possible. Then, place non-living areas, such as gyms, lounges or other communal spaces on the lowest floors of the building, with residential areas above and further away from the ground noise. Because most sound comes in through the windows, use smaller and fewer windows on the lower floors, and gradually increase their size as the floors go up. Setbacks can also help reduce noise. Acoustic windows are an essential component of a quiet building. Every piece of our acoustic window products is designed to block noise without sacrificing aesthetics or appearance, making acoustic windows an essential part of new construction or building renovations in noisy areas. St. 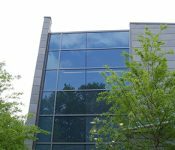 Cloud Window carries a wide variety of commercial windows, custom historic windows, acoustic windows and more. 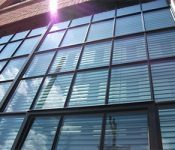 Visit our website to learn more about all of our commercial window products, and contact us to get started. Be sure to check out Fox Business’ Office Spaces hospitality episode featuring St. Cloud Window ultra-high acoustic windows for the construction of a new hotel located next to a Metro train line and at the intersection of two major roadways. Rebroadcast April 8 on Fox Business or available at stcloudwindow.com.